Picture this: one minute you’re peacefully hiking on a beautiful wooded trail in the Northern Rockies, the next you’re fighting for your life when an angry bear charges. If you had your weapon of choice, what would it be? Do you know the best weapon to survive a bear attack in the woods? Understanding basic facts about bear behavior and survival tactics can mean the difference between life and death. More humans than ever are playing in remote bear habitat and greatly increasing the odds of a dangerous bear encounter. In June 2016, a grizzly bear killed a mountain biker near Glacier National Park and one week later, a backpacker was attacked in Denali. Some people might believe that these two could have been saved by a .44 Magnum but the facts prove otherwise. Fact: Rifles and guns are statistically unlikely to stop a bear attack, but bear spray will. In fact, gun-toting hikers may even increase the odds of serious injury to themselves when attempting to use lethal force on an oncoming bear. 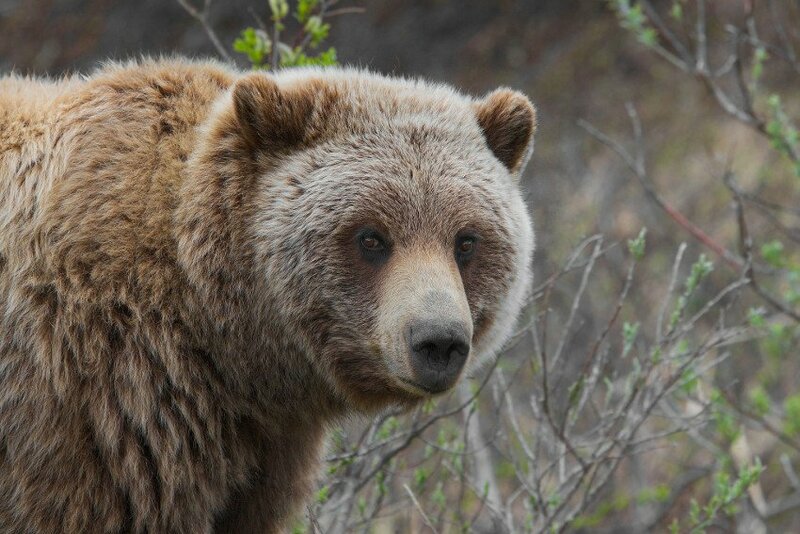 “Bear spray [has] a better success rate under a variety of situations … than firearms,” reports a 2012 Journal of Wildlife study entitled Efficacy of Firearms for Bear Deterrence in Alaska. The study’s conclusion? Bear spray is a more effective weapon to survive a bear attack. Always use an EPA approved product specifically designed to stop aggressive bears. Never apply bear spray to your body or camping gear – bear spray is not a repellent. “Awareness of bear behavior is the key to mitigating potential danger,” says the US Fish and Wildlife Service in a “Bear Versus Bullets” report. Usually, human beings who disregard bear behavior facts are the cause of an attack. Be mindful when hiking near rivers and streams, in tall, grassy meadows or near berry bushes. All are preferred places for bears to eat and relax. When do they do it? Usually in early morning and late afternoon (but not always). Usually, they stumble into it when searching for a meal. Use extreme care when cooking and storing edibles in the outdoors. Remember that RVs are like a giant lunchbox to bears. If your campground has bear-proof storage, use it. If you encounter an animal carcass on the trail, leave immediately as bears could be keeping watch on their next meal. These huge creatures don’t want to meet you, they just want to be left alone. If you get in their personal space, they’ll let you know it. For example, bears stand up because they’re trying to smell you, not because an attack is imminent. If a bear looks you in the eye and has its ears pulled back, you are violating its space. Whatever you do, don’t run. As anyone with a dog knows, many animals have a prey instinct and will give chase when something runs away from it. Instead, just back away slowly from the bear calmly, while keeping your hand on the bear spray canister. Remember, bear attacks are still a rare event when you consider that more people than ever are camping, hiking, and visiting bear habitat. Be aware when you visit their home and you’ll have many opportunities to view these magnificent creatures from a safe (and far) distance. I once bought bear spray. It claimed to work ten times. Presumably that meant you could spray a bear ten times before it was used up. So I decided to use it once to make sure I was familiar with how it worked. Absolutely nothing happened. When I aimed at a target and pressed the button, nothing came out. This was several years ago so I no longer remember the brand name. But if you decide to buy bear spray make sure it has repeat capability so that you can test it to be sure it really will work if you need it. And you might also want to get definitive information about its shelf life after you have tested it once. Excellent advice Rodney, thank you! Pretty sound advice, with a caveat. If there is a non EPA approved product with a good history, I would select it. IMO EPA is the leader in requiring products to “green” up until they no longer do their intended job as efficiently as they once did. After all, they are a political body, first and foremost. Just my opinion but, I haven’t seen a single bear skin rug in front of a fireplace, or hanging on a cabin wall, that got there as a result of a can of bear spray. I would also speculate that people with guns that were injured in bear encounters, either didn’t use adequate caliber, waited too long to shoot, weren’t very good shots when they did, or got ambushed, in which case no effective defense would have been possible. Bear spray wouldn’t have made a difference in any of these situations. Given the choice, I’d still rather have a slug gun, or a heavy caliber center fire brush rifle. Or, simply avoid bear habitat whenever possible. No hike, or campsite, no matter how incredible the scenery or views, is worth your life. Thanks for reading and sharing your opinion Mike! I’ll give Mike the benefit of the doubt and infer he didn’t see the video explaining why guns don’t work as well as bear spray in bear encounters. It’s science, not about what you *feel* is true, Mike. Remember, the goal is to stay alive, and make the bear GO AWAY. Bringing down an unexpected grizzly involves strategy, aim, and other advantages rarely available when “unexpected” is part of the equation. Repelling is much more attainable goal, and the chances of success are greatly improved, with spray. Even in an ambush, a hiker with a hand on their holstered spray has a chance. A gun? Not so much. The science makes more sense than you do. We humans feel powerful and protected with our guns. It’s hard to swallow that they don’t make us invincible in all situations. Excellent points Elena, thank you. I’d imagine not. Plus, how are you going to carry it on the trail? Same way you carry the bear spray. And I bet it will work as good or better than bear spray. Bears are different today than they were 70+ years ago, 1941. We camped in Yosemite Valley in the campground near the stables and the garbage dump (then). Once in a while a bear wandered through or camp in the twilight hours. My aunt was afraid of bears and kept a large dish basin and heavy spoon near her cot (we slept outdoors, not in a tent) to “scare” the bears away. And it worked. In 1957, April or earlyMay, we were walking up to the base of Bridal Veil Falls when I saw a pear stalking a picnicing couple. I asked them to not scare the bear while I took pictures. I got to within about 3-1/2 feet before I YELLED for him/her to “GET OUT OF HERE”. The bear scampered away. They just didn’t like LOUD noises nor brave (and stupid) people. I had spent about a month each summer between 1949 and 1953 backpacking in the Sierra and never worried about bears. Keep food in a bearproof container? Nah, in my pack which I use as a pillow. I taught my son to love hiking and backpacking when he was 6 – and he still does (Google “Kaiser Wilderness Foundation”). And he still does. He tells me that the bears are different nowdays. He changed from leaving food in his pack on the ground to suspending it out of reach between trees. It took a couple years for the bears to figure out how to get the food. Now he carries it in a bearproof container. I can’t imagine carrying that additional weight in my teenage years, but now I guess it’s necessary. Take responsibility for yourself and loved ones. The self serving government agencies, USF&WS,NPS, USFS and others rely heavily on political support from the liberal nature organizations and disseminate policy accordingly. The thought of the Sierra Club criticizing their operations make career government (fat cat) managers shake in their silk lined underwear The RV, Campers and Outdoor enthusiast are well advised to seek.more favorable service by the embedded government agencies as regards to a COOPERATIVE STRATEGY for the public users of PUBLIC OWNED PROPERTIES.. A drastic change is needed in the overly WE ARE IN CHARGE attitude and demeanor of government employees. Gun ranges should be established in Parks and Wilderness areas. Firearm training should be offered..
Bear protection techniques with fire arms should be taught. RV facilities should be IMPROVED as well as road access. As with Bear Spray ammunition should be sold on premises and GUNS allowed in government buildings. YOUR WELFARE is not the prime concern of government management; First is their own backside. Second is their own little self serving community to run. Third their image as animal lovers and champions of.conservation. The TAIL HAS BEEN WAGGING THE DOG FOR TOO LONG!!! Agreed! The article quotes anti-self defense groups. Many of the same people say the same things about self-defense against criminals. Do we need to be vigilant and have situational awareness of course. Would I carry bear spray yes however I have read the details about some bear attacks and in many cases the person emptied an entire can of bear spray down the bear’s throat with little effect. Like bear spray a firearm is a tool and I like to have the most options. We live in bear country. It’s a good idea to carry spray just in case you have to kill one that is attacking you. The feds will be happier if you walk over to the downed critter and spray the stuff on it. They won’t know which came first, the spray or the bullet. “Due to the frequency of human-bear encounters, the B.C. Fish and Wildlife Branch is advising hikers, hunters, fishermen and any persons that use the out of doors in a recreational or work related function to take extra precautions while in the field. “We advise the outdoorsman to wear little noisy bells on clothing so as to give advanced warning to any bears that might be close by so you don’t take them by surprise. “We also advise anyone using the out-f-doors to carry “Pepper Spray” with him is case of an encounter with a bear. Odd, smashing a spoon on a dish pan will scare a bear away, but a gun shot won’t???? Hmmmm…… Dart gun maybe??? Any aggressive animal can and has been taken down by a firearm, but you do have to hit them, under stress that is a lot harder than it sounds. 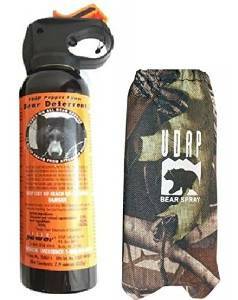 I think it is sad that we have to carry bear spray to stay out of jail, so the bear spray is for us, not the bears. There has never been a documented case of a bear attack being stopped with a high powered handgun where the attacked wasn’t savaged. I’ve personally seen bears with their heart blown apart by a high power rifle still run hundreds of yards. I witnessed a small black bear shot close range with a 12g slug have the slug flatten on its breast plate and end up under the skin doing no lethal damage. You are in the Bears home. No need to kill it if there is another much more effective method to descelate the situation. And I’m a bear hunter, having taken three bears in my life. And I’ve been involved with dozens of bears being harvested legally during hunting seasons. So I’m no tree hugger. The very best gun or repellent is the one you have with you when you need it. A casul magnum in the truck is not as good as a .38 in your hand. For a bear that is in attack mode I have no confidence in spray. This after spending 45 years living in an area with more bears and wolves than people. Am definitely more afraid of people and mean dogs than of bears. – 84% out of 357 bears, 299.88 bears was killed with a handgun. 76% +84% not equals to 100% for counted encounters. Or my math is off? (we have multiple game cameras on the property), and are well versed in not keeping trash anywhere except in a sealed 55-gallon drum. We empty the drum once per week or so at the country disposal site. As for the “best” way to defend against a bear attack; there is no one “best” way. It depends on the circumstances, how sudden an attack is, whether or not the person has a firearm adequate for the job and that the firearm is within easy reach; whether or not the person is on a bicycle or walking in dense forest with limited visibility; whether the bear is a male or female with cubs, and ad infinitum. Bear attacks are not preventable; it depends on the bear, whether food or food-containing trash is present, and how familiar the bear is with the landowner. Many times, bears are merely curious, rather than being hungry. It is up to the human to know the territory, and be prepared to know what to do in case of a bear attack. If bicyclists or hikers know they are in bear country, know bears are in the vicinity and are active, and yet to choose to blithely continue on their bike/hiking journey, they need to have their heads examined. Same applies to mountain lion country. Last Spring, we arrived to our property after the snow had melted and found evidence that a mountain lion had made its home under our 5th wheel. There had been reports of domestic foul (chickens and ducks) being attacked at severa neighbors’ properties. We keep a sharp eye out for both bears and mountain lions, talk to our neighbors to trade information, and do everything possible to avoid situations that would invite attacks from these animals. I don’t want to shoot them, and would do so only as a last resort. Since noise to scare away bears seem to work. Why not get a boating compressed air horn? Just a can with an air horn on the end….pretty loud. My wife carries the spray and I carry the gun. You won’t have time to use spray and then a gun if you are being attacked; you must choose. I just read this article so apologies for the late comment. One minor correction: the EPA does not approve any commercially sold products or chemicals. Manufacturers of chemical animal repellents and pesticides must register their products with the EPA; and as with all hazardous commercial products, must provide Material Safety Data Sheets (MSDS) to the public upon request -usually by making them available online AND at the stores where products are sold.